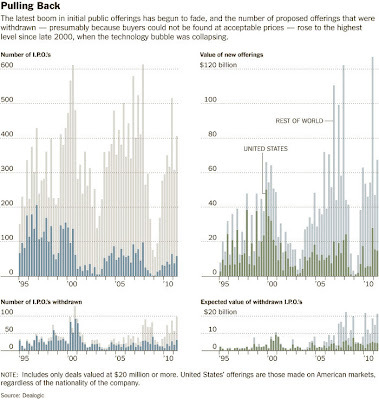 "The global market for initial public offerings of stock, which was hot in late 2010, has cooled. In just a few months, the market has gone from raising record amounts of money to reaching a 10-year high in the number of proposed offerings withdrawn because there was no market. During this year’s second quarter, 98 offerings -- which had been projected to raise $21 billion -- were withdrawn, according to calculations by Dealogic. The number of canceled offerings was the highest since 129 proposed offerings were canceled in the fourth quarter of 2000, as it became clear that the technology bubble had burst."